Hello, meet Charles and Chris! Charles and Chris, pictured above. 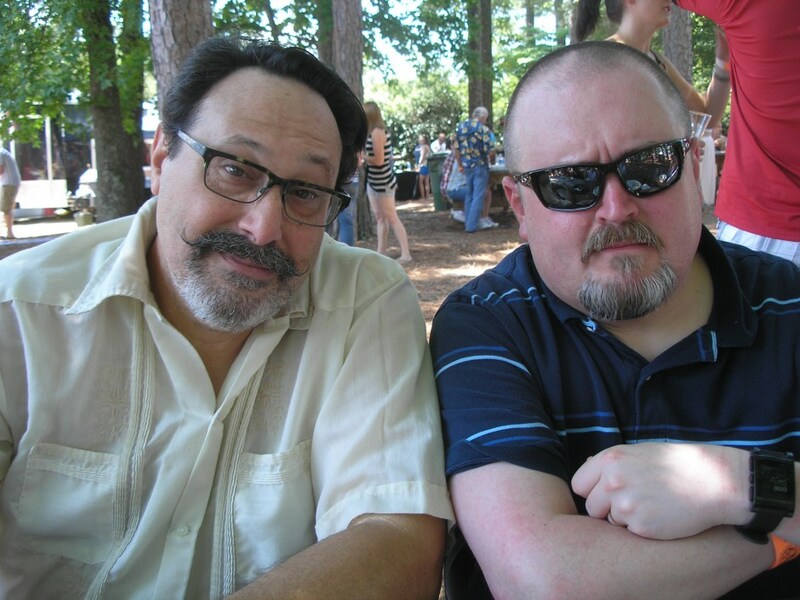 2 gentlemen, 1 Jewish & 1 Christian, blogging and podcasting about faith, cigars, mental health, cigars, social justice, cigars, and other interfaith issues. Oh, and cigars. In our podcast we focus on faith, mental health, and cigars. We approach these subjects from many directions: personal, academic, theological, and philosophical. However, we are less than enthusiastic with the description of our blog, our podcast, and even our relationship as “interfaith.” Interfaith is such a constricting term, so we created a new moniker for what we do—interfaithED. We want anyone wishing to join in our discussions to understand our goal, to share our respect for each other and The Other. In order to learn grow, and expand our view requires we put ourselves in uncomfortable situations, that we expose ourselves to “dangerous” ideas, but that learning only happens when we are uncomfortable, and ideas only seem dangerous because they come from The Other. Episode 86 finds Dr. Charles, Rev. Chris, and Mother Helena…she said I could call her that in this episode… Anyway, we discuss cigars…big shocker there. Then we comment on the State of the Union address. And we talk about the similarities and differences between the Law and the Beatitudes. Does Jesus fulfill the law? Does Jesus make a departure from the Law? Be a mensch and give it a listen. Episode 84 finds the intrepid trio discussing “how evangelicals, once culturally confident, became an anxious minority seeking political protection from the least traditionally religious president in living memory.” The not-nearly-so holy trinity (we’ll let you figure out who is who) makes a deep dive in an article that appeared in The Atlantic (April 2018 by Michael Gerson. (That’s where we stole that pithy quote at the beginning of this blurb.) This episode was also informed by an article in Salon magazine by Dr. Bandy X. Lee, a Yale Psychiatrist. And to add some levity, even if it is gallows humor, an article in Huffington Post that the Jew found that the Gentile swore came from the Onion. In Episode 82, Chris, Charles, and Helena are joined by Russ Jennings, of Love in a Dangerous Time podcast and Wild Goose Festival’s Goosecast Stage, and consider a new term, “Liminal Christianity.” Cited as part of this discussion is Dietrich Bonhoeffer’s letter to Ebehard Bethge dated April 30, 1944. In this letter, Bonhoeffer introduces the world to the notion of “Religionless Christianity” Click HERE to download a copy of the letter.